The rat lutropin/choriogonadotropin receptor (rLHR) is a member of the rhodopsin-like subfamily of G protein-coupled receptors that has two adjacent dileucine motifs in the C-terminal cytoplasmic tail. Here we show that simultaneous (L613,614,615,616A) or individual (L613,L614A or L615,616A) mutation of the two adjacent dileucine motifs to alanines results in mutants with enhanced rates of agonist-induced internalization. The L613,L614A mutation was much more effective in enhancing internalization than the L615,L616A mutation. Moreover, the L613A mutation was more effective than the L614A mutation. Because in the human LHR the residues equivalent to L613 and L614 of the rLHR are a phenylalanine and a leucine (F635 and L636), we also prepared mutants that exchanged these motifs. In the rLHR, an LL-to-FL exchange enhanced endocytosis, and in the human LHR, an FL-to-LL exchange impaired endocytosis. The internalization of rLHR-wt and rLRH-L613,L614A was inhibited by coexpression of the clathrin-binding domain of β-arrestin. In fact, this manipulation reduced the enhanced rate of internalization of rLHR-L613,614A back to that of rLHR-wt. The L613,614A mutation does not affect the degradation of the internalized agonist or the membrane targeting of the nascent rLHR. The L615,616A mutation also did not affect degradation of the internalized agonist but impaired the membrane targeting of the nascent rLHR. We conclude that the dileucine-based motifs of the rLHR inhibit internalization and suggest that this inhibition may be due to an impairment in the binding of the rLHR to endogenous nonvisual arrestins. Like many other cell surface receptors, the G protein-coupled receptors (GPCRs) are internalized by endocytosis. For most of these receptors, endocytosis is triggered by agonist-induced activation and requires the phosphorylation of the receptor, an event that promotes the association of the GPCR with a family of proteins called arrestins. The nonvisual arrestins are clathrin-binding proteins, which then target the phosphorylated GPCRs to clathrin-coated pits for subsequent endocytosis (Koenig and Edwardson, 1997; Krupnick and Benovic, 1998; Lefkowitz, 1998). Studies from this and other laboratories have shown that the lutropin/choriogonadotropin receptor (LHR) generally follows the internalization pathway summarized above for the majority of GPCRs. The agonist-occupied LHR is internalized via coated pits (Ghinea et al., 1992) by a pathway that can be inhibited with a dominant-negative mutant of dynamin or the clathrin-binding domain of β-arrestin (Lazari et al., 1998). The rate of internalization of the agonist-activated LHR is faster than that of the free receptor or that of the receptor activated by a weak partial agonist (Lloyd and Ascoli, 1983; Hoelscher et al., 1991; Min et al., 1998), and mutations of the receptor that impair or enhance agonist-induced activation have a parallel effect on agonist-induced internalization (Dhanwada et al., 1996; Min et al., 1998). Mutation of the sites phosphorylated in response to agonist-induced activation also impair agonist-induced internalization of the LHR (Wang et al., 1997; Lazari et al., 1998). Last, overexpression of arrestin-3 enhances agonist-induced internalization (Lazari et al., 1998). Unlike most other GPCRs, however, the internalized LHR does not recycle back to the plasma membrane. Once internalized, the agonist-LHR complex traverses the endosomal compartment and is delivered to the lysosomes without dissociation (Ascoli, 1984; Ghinea et al., 1992). Additional studies indicate that there are other structural features of the LHR that participate in agonist-induced endocytosis; thus, the rate of internalization of the agonist-rat LHR (rLHR) complex is much slower (T1/2 = 60–120 min, depending on the cell type) than that of most GPCRs (Lloyd and Ascoli, 1983; Hoelscher et al., 1991; Dhanwada et al., 1996; Wang et al., 1997; Lazari et al., 1998; Min et al., 1998). Studies using chimeras of the rLHR and the closely related rat follitropin receptor (Nakamura and Ascoli, 1999) indicate that the extracellular domain of these receptors, a region that is not phosphorylated or involved in arrestin binding, has a substantial effect on the rate of internalization. Truncations of increasing portions of the C-terminal tail can impair or enhance agonist-induced internalization independently of agonist-induced activation or agonist-induced phosphorylation (Rodrı́guez et al., 1992; Wang et al., 1996). Last, the mutation of two adjacent cysteines present in the C-terminal tail of the LHR has also been reported to impair the agonist-induced endocytosis of the LHR without affecting signaling (Kawate and Menon, 1994). Clues about additional structural features that may participate in the endocytosis of GPCRs can be derived by scanning their intracellular regions for the existence of internalization signals previously described in other membrane proteins. Several internalization signals have been described in cell surface receptors that have a single membrane spanning domain (Kirchhausen et al., 1997). Two of these, a tyrosine-based motif (NPXXY in transmembrane helix 7) and a leucine-based motif (LL in the juxtamembrane region of the C-terminal cytoplasmic tail), are present and conserved among many GPCRs, including the LHR (see alignment in Schulein et al., 1998). Studies performed with the β2-adrenergic receptor have shown that mutations of the NPXXY motif impair agonist-induced endocytosis, but they appear to do so indirectly, by preventing the agonist-induced activation and subsequent phosphorylation of this receptor, rather than by a direct participation of this motif in endocytosis (Ferguson et al., 1997). In contrast, a more direct participation of the dileucine motif in the agonist-induced internalization of the β2-adrenergic receptor is indicated by the finding that mutation of this motif had little or no effect on signaling but impaired agonist-induced endocytosis (Gabilondo et al., 1997). More recently, however, it was reported that mutation of the dileucine motif of the thromboxane A2 receptor has no effect on internalization (Parent et al., 1999). The current study was designed to investigate the involvement of leucine-based motifs on the agonist-induced internalization and other aspects of the trafficking of the LHR. A full-length cDNA encoding for the rLHR was obtained as described previously (McFarland et al., 1989) and was subcloned into pcDNAI/Neo for expression. A plasmid containing the entire coding region of the human LHR (hLHR; Minegishi et al., 1990) was initially provided to us by Ares Advanced Technology and was subcloned into pcDNA3.1 for expression. Mutants were constructed using polymerase chain reaction strategies, and their identity was verified by automated DNA sequencing (performed by the DNA Core of The Diabetes and Endocrinology Research Center of the University of Iowa). A plasmid coding for a HA-tagged dominant-negative mutant form of dynamin (i.e., dynamin K44A; see Damke et al., 1994) was obtained from Dr. Sandra Schmid (Scripps Research Institute) and subcloned into pcDNA3.1 (InVitrogen, San Diego, CA) for transfection. The expression vectors (both in pcDNA3.1) coding for arrestin-3 and β-arrestin(319–418) have been described (Krupnick et al., 1997) and were generously provided by Dr. Jeff Benovic (Thomas Jefferson University). Human embryonic kidney 293 cells were obtained from American Type Culture Collection (CRL 1573; Rockville, MD) and maintained in Dulbecco’s modified Eagle’s medium containing 10 mM HEPES, 10% newborn calf serum, and 50 μg/ml gentamicin, pH 7.4. Transient transfections were performed according to the calcium phosphate method as described elsewhere (Dhanwada et al., 1996; Wang et al., 1996, 1997;Lazari et al., 1998; Min et al., 1998). Cells were plated onto 35-mm wells and transfected with 1 to 2 μg of plasmid when 70 to 80% confluent. After an overnight incubation, the cells were washed, placed back in the incubator, and used 24 h later. The LHR-mediated endocytosis of125I-labeled human choriogonadotropin (125I-hCG) was measured as follows. Transiently transfected cells (plated onto 35-mm wells) were preincubated in 1 ml of Waymouth’s MB752/1 containing 1 mg/ml BSA and 20 mM HEPES, pH 7.4 (assay medium), for 30 to 60 min at 37°C. Each well then received 10 ng/ml 125I-hCG, and the incubation was continued at 37°C. At the times indicated, cells were placed on ice and washed two or three times with 2-ml aliquots of cold Hanks’ balanced salt solution containing 1 mg/ml BSA (wash medium). The surface-bound hormone was then released by incubating the cells in 1 ml of cold 50 mM glycine and 150 mM NaCl, pH 3, for 2 to 4 min (Ascoli, 1982). This buffer was removed, and the cells were washed once more. The acid buffer washes were combined and counted, and the cells were solubilized with 100 μl of 0.5 N NaOH, collected with a cotton swab, and counted. The radioactivity associated with the acid washes was considered to be surface-bound hormone, whereas that associated with the solubilized cells was considered to be internalized hormone. The endocytotic rate constant (ke) was calculated from the slope of the line obtained by plotting the internalized radioactivity against the integral of the surface-bound radioactivity or from the slope of the line obtained by plotting the ratio of internalized to surface-bound radioactivity versus time (Wiley and Cunningham, 1981,1982; Lloyd and Ascoli, 1983; Ascoli and Segaloff, 1987). Similar results were obtained using either plot (see Fig. 2), but we routinely used the latter plots because they tended to be linear with more data points. Determinations of ke were made using at least five different data points collected at 3- to 10-min intervals (depending on the construct used). In calculation of the rates of internalization by this method, care must be taken to chose time points before the release of degradation products of the internalized hormone into the medium (Wiley and Cunningham, 1981, 1982; Lloyd and Ascoli, 1983; Ascoli and Segaloff, 1987). Because degradation products of the125I-hCG internalized by rLHR-wild type (wt) are releases within 60 min of internalization (Ascoli, 1982), the longest time point used was for rLHR-wt was 50 min, For mutants with a faster internalization rate, the longest time point used was empirically determined to be 20 to 30 min depending on the construct. The half-time of internalization (T1/2) is defined as 0.693/ke. Rates of internalization of 125I-hCG in 293 cells transiently transfected with rLHR-wt or rLHR-L613,L614A. 293 cells transiently transfected with rLHR-wt (top) or rLHR-L613,L614A (bottom) were preincubated in warm medium for 1 h. At the end of this incubation (t = 0), the cells received 125I-hCG (10 ng/ml), and the incubation was continued at 37°C. A and D, surface-bound and internalized radioactivity was measured at the times indicated using the acid release procedure described inMaterials and Methods. 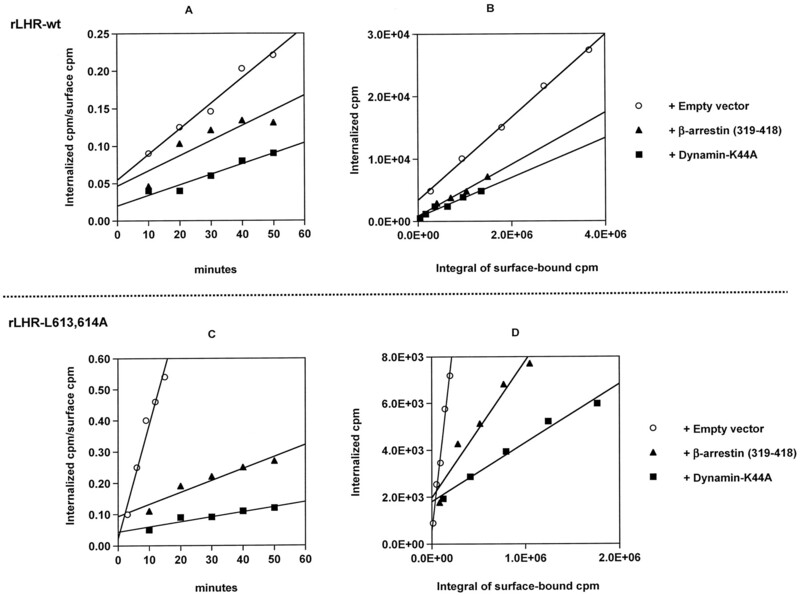 B and E, plots of the ratio of internalized to surface ligand versus time. The straight lines were obtained using a linear least-squares fit of the data points shown. C and F, the integral of the surface-bound radioactivity was calculated at each time point as described in Materials and Methods, and a plot of the internalized hormone versus the integral of the surface-bound hormone was generated as shown. The straight line shown through the points was obtained using a linear least-squares fit of the data points. The results of a representative experiment are shown. Note that the scales are different in each panel. This was measured using modifications of previously published procedures (Lloyd and Ascoli, 1983; Ascoli and Segaloff, 1987; Hoelscher et al., 1991). Transfected cells were washed as described above and then incubated with125I-hCG (10 ng/ml) for 2 h at 37°C. The cells were then placed on ice and washed two or three times with 2-ml portions of cold wash medium. The surface-bound hormone was then released by incubation of the cells in 1 ml of cold 50 mM glycine and 150 mM NaCl, pH 3, for 2 to 4 min (Ascoli, 1982). This buffer was removed, and the cells were washed once more with the same acid buffer and then once with cold assay medium. The cells were placed back in 1 ml of warm assay medium containing 50 ng/ml hCG (to prevent the reassociation of any undegraded 125I-hCG released from the cells back into the medium), and a second 2-h incubation at 37°C was conducted to allow the cells to process the hormone that had been internalized during the first incubation. At the end of the second incubation, the dishes were placed on ice, the medium was saved, and the cells were washed once with 2 ml of cold wash medium. The assay and wash media washes were combined and precipitated with 10% trichloroacetic acid to determine the amounts of degraded and undegraded hormone released (Ascoli, 1982). The cells were then solubilized with NaOH (see above) and used to determine the amount of hormone that remained cell associated. Binding of125I-hCG to intact cells was performed during an overnight incubation with 100 ng/ml 125I-hCG at 4°C as described elsewhere (Wang et al., 1993). Detergent extracts used to measure 125I-hCG binding were obtained by solubilizing the cells in 0.5% Nonidet P-40, 20 mM HEPES, 100 mM NaCl, 20% glycerol, and 1 mM EDTA, pH 7.4, using a constant ratio of 100 μl of detergent solution/1 million cells as described elsewhere (Ascoli, 1983; Wang et al., 1993). The detergent concentration was diluted to 0.1%, and triplicate aliquots of the extracts were incubated with 100 ng/ml 125I-hCG. The third aliquot also received 50 IU/ml crude hCG to correct for nonspecific binding. The free and bound hormones were separated as described previously (Ascoli, 1983; Wang et al., 1993). The cells were washed twice with 2 ml of warm assay medium and placed in 1 ml of the same medium containing 1 mM isobutylmethylxanthine. After a 15-min preincubation at 37°C, increasing concentrations of hCG were added, and the incubation was continued for 30 min at 37°C. The wells were then placed on ice, and the total cAMP (in the cells and medium) was extracted by adding 1 ml of 2 N perchloric acid containing 360 μg/ml theophylline. The samples were subjected to rapid cycle of freezing and thawing, and the debris was collected by centrifugation. The supernatants were neutralized and then used for cAMP measurement by radioimmunoassay. Three wells were used for each data point in all experiments involving the measurement of125I-hCG binding (see sections about internalization, fate of internalized hormone, and hormone binding experiments). Two of these received125I-hCG only, and the third received125I-hCG and 50 IU/ml crude hCG to correct for nonspecific binding. Statistical analysis (t test with two-sided p values) was performed using InStat (GraphPAD Software, San Diego, CA). Purified hCG (CR-127) was kindly provided by the National Hormone and Pituitary Agency of the National Institute of Diabetes and Digestive and Kidney Diseases.125I-hCG was prepared as described elsewhere (Ascoli and Puett, 1978). 125I-cAMP and cell culture medium were obtained from the Iodination Core and the Media and Cell Production Core, respectively, of the Diabetes and Endocrinology Research Center of the University of Iowa. Other cell culture supplies and reagents were obtained from Corning (Palo Alto, CA)and Life Technologies (Grand Island, NY), respectively. All other chemicals were obtained from commonly used suppliers. Mutation of Dileucine-Based Motifs Enhances Agonist-Induced Internalization of LHR without Affecting Signaling. Although a dileucine-based motif present in the juxtamembrane region of the C-terminal tail is conserved in most GPCRs (see alignment in Schulein et al., 1998), the LHR is unusual in that depending on the species of origin, it has three (mouse, human, and porcine) or four (rat) contiguous leucines in this position (Fig.1). In the experiments described below, we chose to examine the involvement of this region on the internalization of the rLHR and hLHR. Amino acid sequence alignment of the juxtamembrane region of the C-terminal tail of the LHR from several species, the human β2-adrenergic receptor, and the human arginine-vasopressin V2 receptor. Sequences were obtained from the SWISS-PROT databank and have the following accession numbers: rLHR (P16235), mouse LHR (P30730), porcine LHR (P29525), hLHR (P22888), human β2-adrenergic receptor (P07550), and human arginine V2 receptor (P30518). The partial sequences shown start at the conserved NPXXY motif (shaded in gray) present in the seventh transmembrane domain (enclosed in a box). Dileucine motifs and a conserved acidic residue located upstream and separated by at least three amino acids from the dileucine motif are in black. The additional dileucine motif present in the rLHR is marked with asterisks. Palmitoylated cysteines are also shaded in gray. The rate of internalization of 125I-hCG mediated by the rLHR-wt or mutants thereof was measured as summarized in Fig.2. Transiently transfected 293 cells were incubated with 125I-hCG at 37°C, and surface-bound and internalized 125I-hCG was measured at different times after the addition of the hormone (Fig. 2, A and D). Using this paradigm, a rate constant for internalization (ke) can be calculated from the slopes of plots of the ratio of internalized to surface-bound hormone versus time (Fig. 2, B and E) or from the slopes of plots of the internalized hormone versus the integral of the surface-bound hormone (Fig. 2, C and F) as described inMaterials and Methods. Regardless of the plot used, a half-time of internalization (T1/2) is defined as 0.693/ke. Leucine-to-alanine mutations of the four adjacent leucines in the rLHR (L613,614,615,616A) shortened the T1/2 of internalization by ∼3-fold (Table 1). Mutation of the two adjacent dileucine motifs revealed that this shortening of the T1/2 of internalization was mediated mostly by the first dileucine motif. Thus, the L613A,614A mutation shortened the T1/2 of internalization ∼7-fold, whereas the L615,L616A mutation shortened the T1/2 of internalization by <2-fold (Table 1). Individual mutations of L613 or L614 revealed that both of these residues affect internalization, but the mutation of L613 had a greater effect than the mutation of L614 (Table 1). Because the first leucine of the tetraleucine motif present in rLHR is substituted by a phenylalanine in the hLHR as well as in the LHR from several other species (cf. Fig. 1), we also compared the internalization of mutants of the rLHR and hLHR where the sequence of this motif was exchanged. The results presented in Fig.3 show that theT1/2 of internalization of the hLHR is much faster (∼18 min) than that of the rLHR (∼100 min). 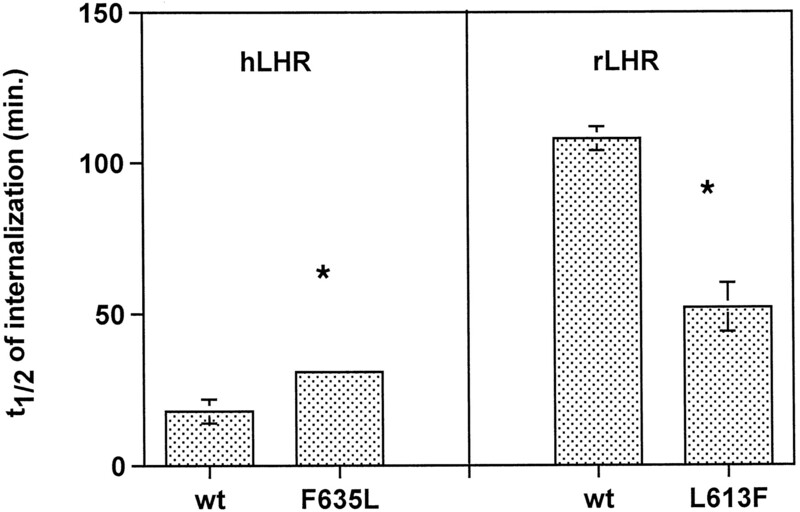 Mutation of the LLLL motif in rLHR to FLLL shortens theT1/2 of internalization of the rLHR to ∼50 min, whereas mutation of the FLLL motif in hLHR to LLLL lengthens the T1/2 of internalization of the hLHR to ∼30 min. Internalization of 125I-hCG mediated by rLHR-wt, hLHR-wt, and mutants thereof. Cells were transiently transfected with the indicated constructs, and theT1/2 values for internalization were measured as described in Materials and Methods. Each bar represents the mean ± S.E.M. of three independent transfections. Note that the different numbering in rLHR and hLHR is simply because the codons in the hLHR have always been numbered from the N terminus of the hLHR precursor (i.e., including the signal peptide), whereas codons in the rLHR have always been numbered starting from the known N terminus of the mature protein. *p < .05 compared with corresponding LHR-wt. Taken together, these results show that the two dileucine motifs present in the C-terminal tail of the rLHR inhibit the endocytosis of the agonist-receptor complex, but the first motif seems to be more important than the second motif. The involvement of dileucine motifs in the endocytosis of other receptors, such as the T cell receptor (Geisler et al., 1998), the insulin receptor (Hamer et al., 1997), the prolactin receptor (Vincent et al., 1997), the growth hormone receptor (Govers et al., 1998), and the β2-adrenergic receptor (Gabilondo et al., 1997), has been previously documented. In all of these receptors, however, mutation of the dileucine motifs inhibits endocytosis rather than enhancing it as reported here for the LHR. Because we have previously shown that there is a positive correlation between rLHR signaling and the rate of endocytosis of the agonist-rLHR complex (Hoelscher et al., 1991; Dhanwada et al., 1996; Min et al., 1998), it was important to determine whether the mutations described above affected the signaling properties of the rLHR. This possibility was examined with the two mutants that had the greatest effect on internalization (i.e., rLHR-L613,614A and rLHR-L613A, cf. Fig. 2 and Table 1). The results of these experiments are presented in Fig.4 and show that the binding and signaling properties of cells expressing either of these two mutants were normal. Thus, the effects of mutation of L613 and L614 on the endocytosis of hCG are not due to changes in signaling. Signaling properties of the rLHR-wt and mutants thereof. Cells were transiently transfected with the indicated constructs. 125I-hCG binding was measured during a 1-h incubation at room temperature using a single, saturating concentration of 125I-hCG (100 ng/ml). Total cAMP accumulation was measured during a 30-min incubation with the indicated concentrations of hCG as described in Materials and Methods. Each value represents the mean ± S.E.M. of three independent transfections. Rat LHR-wt and LHR-L613,614A Are Internalized by an Arrestin- and Dynamin-Dependent Pathway. Because rLHR-wt is internalized by a pathway that requires the participation of a nonvisual arrestin and dynamin (Lazari et al., 1998), it was important to determine whether the enhancement of endocytosis induced by mutation of the dileucine motif also had an effect on the pathway used for endocytosis. This possibility was examined by testing the effects of overexpression of arrestin-3, a dominant-negative mutant of the nonvisual arrestins (Krupnick et al., 1997) and a dominant negative mutant of dynamin (Damke et al., 1994), on the agonist-induced internalization of rLHR-wt and rLHR-L613,614A. The results of these experiments are presented in Fig. 5 and Table2 and show that overexpression of β-arrestin(319–418) or dynamin-K44A lengthened theT1/2 of internalization of rLHR-L613,614A and rLHR-wt. 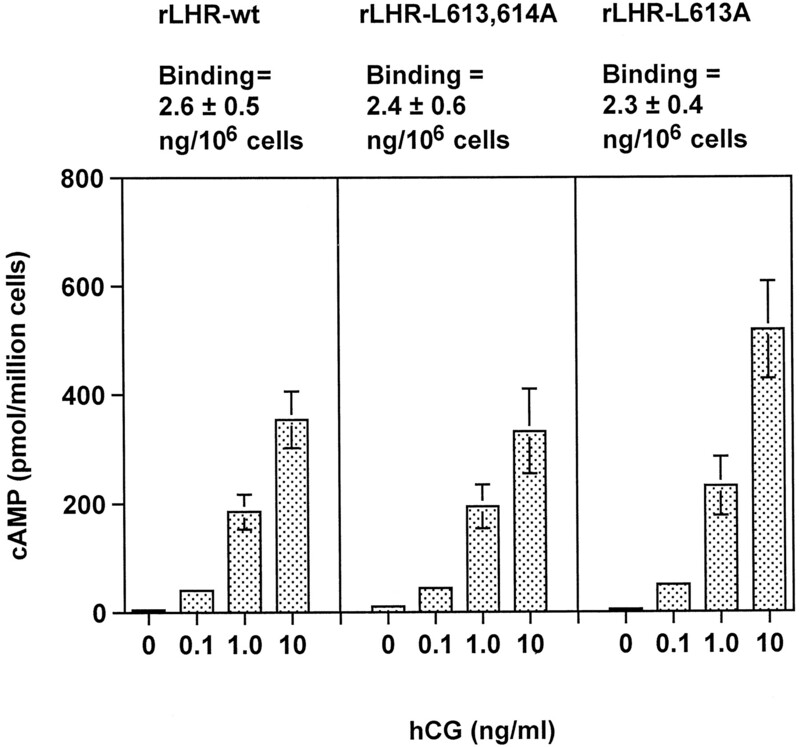 The T1/2 of internalization of hCG in cells transfected with rLHR-wt alone is comparable with that detected in cells cotransfected with rLHR-L613,L614A and β-arrestin(319–418); on the other hand, theT1/2 of internalization of hCG in cells cotransfected with rLHR-wt and dynamin-K44A is comparable with that detected in cells cotransfected with rLHR-L613,L614A and dynamin-K44A. The data presented in Table 2 also show that overexpression of arrestin-3 shortens the T1/2 of internalization of rLHR-wt and rLHR-L613,614A. It is interesting to note, however, that the T1/2 of internalization of hCG in cells transfected with rLHR-L613,614A alone is comparable with that detected in cells cotransfected with rLHR-wt and arrestin-3. Effect of β-arrestin(319–418) and dynamin-K44A on the rates of internalization of 125I-hCG mediated by rLHR-wt or rLHR-L613,L614A. 293 cells were transiently cotransfected with the rLHR-wt (top) or rLHR-L613,L614A (bottom) and the other indicated constructs. The cells were preincubated in warm medium for 1 h. At the end of this incubation (t = 0), the cells received 125I-hCG (10 ng/ml), and the incubation was continued at 37°C. The surface-bound and internalized radioactivity was measured at 3- to 10-min intervals as described in Materials and Methods. A and C, plots of the ratio of internalized to surface ligand versus time are shown. The straight lines shown were obtained using a linear least-squares fit of the data points. B and D, the integral of the surface-bound radioactivity was calculated at each time point as described in Materials and Methods, and a plot of the internalized hormone versus the integral of the surface-bound hormone was generated as shown. The straight line shown through the points was obtained using a linear least-squares fit of the data points. The results of a representative experiment are shown. Note that the scales are different in each panel. Effect of Leucine Mutations on Other Aspects of Intracellular Trafficking of rLHR. In addition to their participation in endocytosis, dileucine motifs have also been shown to function in the targeting of proteins to the basolateral surface of epithelial cells, in the sorting of proteins from the trans-Golgi network to endosomes and lysosomes (Kirchhausen et al., 1997), and in the sorting of the arginine vasopressin V2 receptors from the endoplasmic reticulum to the plasma membrane (Schulein et al., 1998). In light of this information, we also examined the effect of leucine mutations on the degradation of the internalized hCG and on the targeting of the nascent rLHR to the plasma membrane. Because the internalized rLHR-receptor complex is delivered to the lysosomes in the intact form (i.e., without ligand dissociation; seeAscoli, 1984; Ghinea et al., 1992), measurements of the degradation of the internalized hCG can be used to indirectly (but conveniently) assess the targeting of the internalized hCG-receptor complex to the lysosomes. The degradation of the internalized hCG was measured using a protocol that allows for measurement of hormone degradation in a manner that is independent of the rate of internalization (Lloyd and Ascoli, 1983; Ascoli and Segaloff, 1987; Hoelscher et al., 1991). This protocol consisted of two incubations. During the first incubation, cells expressing the different mutants were allowed to internalize125I-hCG for 2 h at 37°C. The cells were then washed with a neutral buffer to remove the free125I-hCG and with an acidic buffer to remove the surface-bound 125I-hCG (t = 0), and a second incubation (2 h at 37°C) was performed to allow the cells to process the internalized agonist. An excess of hCG was present in the medium to prevent the reassociation of any undegraded125I-hCG released from the cells during the second incubation. At the end of this incubation (t = 2 h), the medium was assayed for degraded and undegraded hormone released, and the cells were used to determine the amount of125I-hCG that remained cell associated. Internalization was stopped from occurring at t = 0, so all the degraded and undegraded 125I-hCG found at t = 2 h was derived from the 125I-hCG that was internalized during the first incubation. At t = 0, more than 90% of the cell-associated radioactivity was located intracellularly regardless of the plasmid used to transfect the cells (data not shown). 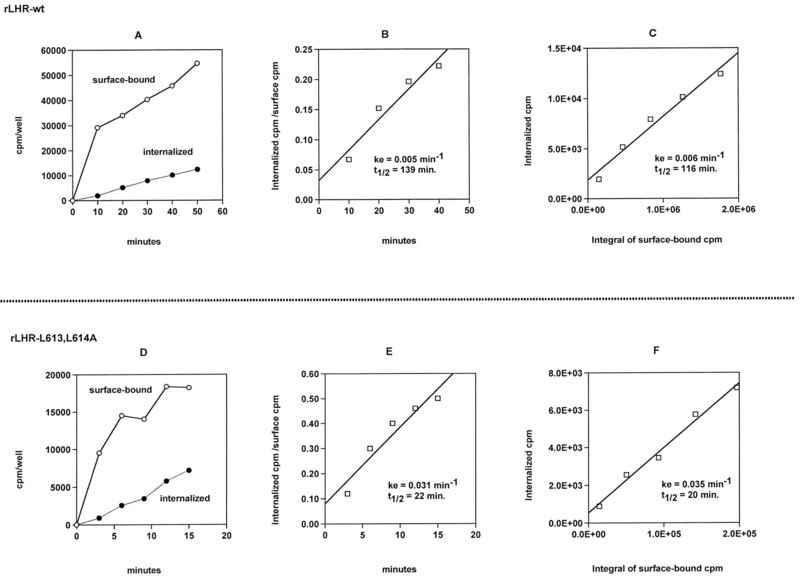 At t = 2 h, cells expressing rLHR-wt retained ∼70% of the radioactivity that was initially internalized (Table3). The remaining ∼30% of the radioactivity was released back into the medium, mostly as degraded hormone (Table 3). The data presented in Table 3 also show that none of the leucine-to-alanine mutations had any effect on the release of degraded and undegraded hormone. The potential effect of leucine mutations on the targeting of the newly synthesized rLHR to the plasma membrane was assessed by comparing125I-hCG binding to intact cells at 4°C, a condition that allows for binding of 125I-hCG only to the ∼85-kDa mature cell surface rLHR, and to detergent extracts, a condition that allows for binding of125I-hCG to the ∼85-kDa mature cell surface rLHR as well as the ∼68-kDa rLHR precursor present in the endoplasmic reticulum (Fabritz et al., 1998). This assay is valid because the ∼68-kDa intracellular rLHR precursor and the ∼85-kDa mature cell surface rLHR bind 125I-hCG with the same affinity (Fabritz et al., 1998). The results presented in Table 4 show that the leucine mutations described above had little or no effect on the total expression of the rLHR (i.e., the binding of125I-hCG to detergent extracts was 3 to 5 ng/106 cells for cells expressing rLHR-wt or mutants thereof), but some of them affected the targeting of the rLHR to the cell surface. In agreement with previous results (Segaloff and Ascoli, 1993; Wang et al., 1993; Rozell et al., 1995), the data presented in Table 4 also show that ∼70% of the rLHR-wt was targeted to the cell surface. In contrast, only ∼26% of rLHR-L613,614,615,616A was targeted to the cell surface (Table 4). This intracellular trapping of rLHR-L613,614,615,616A appeared to be due mostly to the mutation of L615 and L616 because 56 to 73% of rLHR-L613,614A, rLHR-L613A, or rLHR-L614A was targeted to the cell surface, whereas only 34% of rLHR-L615,616A was targeted to the cell surface (Table 4). Because many dileucine-based motifs are flanked by an upstream acidic residue (cf. Fig. 1 and alignment in Schulein et al., 1998), and this acidic residue has also been implicated in receptor trafficking (Kirchhausen et al., 1997; Schulein et al., 1998), we prepared one additional rLHR mutant in which an aspartic acid (D611N) located upstream of the tetraleucine motif of the rLHR (cf. Fig. 1) was mutated to asparagine and tested for its effect on cell surface targeting. As shown in Table 4, this mutation drastically impaired the trafficking of the rLHR to the cell surface. This impairment in the cell surface expression of the D611N mutant prevented us from assessing the role of this residue on the internalization of hCG. Agonist-induced receptor activation is an important event in triggering the endocytosis of GPCRs in general (Lefkowitz, 1998) and the LHR in particular (Lloyd and Ascoli, 1983; Hoelscher et al., 1991;Min et al., 1998), so we have suggested that the same, or a very similar, active conformation of the rLHR is involved in the stimulation of G proteins and the endocytosis of the agonist-rLHR complex (Min et al., 1998). As such, mutations that affect agonist-induced rLHR activation are thought to have a corresponding effect on the endocytosis of the agonist-rLHR complex that may be considered indirect in nature (i.e., mediated by their effects on the active conformation of the rLHR). In contrast, mutations that affect the endocytosis of the agonist-rLHR complex without affecting signaling are likely to do so because of a more direct participation of the region or residue in question in the endocytic pathway. This contention is also supported by the finding that most of the mutations that affect signaling and endocytosis are located in the transmembrane domains of the rLHR (see above), a region of the rLHR that is unlikely to be directly exposed to the endocytic machinery, whereas all of the known mutations that affect endocytosis without affecting signaling are located in the C-terminal cytoplasmic tail of the rLHR, a region that is likely to be directly exposed to the endocytic machinery. Moreover, protein sorting motifs identified in other receptors that interact directly with the endocytic machinery are generally located in their cytoplasmic domains (Kirchhausen et al., 1997). Dileucine motifs have been previously shown to be important in the targeting of proteins to the basolateral surface of epithelial cells, the sorting of proteins from the trans-Golgi network to the endosomal/lysosomal compartments (Kirchhausen et al., 1997), the exit of proteins from the endoplasmic reticulum to the plasma membrane (Schulein et al., 1998), and the endocytosis of cell surface receptors (Dietrich et al., 1997; Gabilondo et al., 1997; Hamer et al., 1997;Vincent et al., 1997; Geisler et al., 1998; Govers et al., 1998). The data presented here show that a tetraleucine motif (L613-L616) present in the C-terminal cytoplasmic tail of the rLHR (Fig. 1) affects the internalization and externalization of this receptor. The simultaneous mutation of L613 and L614 enhances agonist-induced internalization (Fig. 2 and Table 1) but has no effect on signaling (Fig. 4), degradation of the internalized hormone (Table 3), or the targeting of the rLHR to the cell surface (Table 4). The ability of this dileucine motif to inhibit internalization is further supported by the finding that grafting it into the C-terminal tail of the hLHR inhibits the internalization of the agonist-hLHR complex (Fig. 3). Mutation of the second two leucines (L615 and L616) of the tetraleucine motif of the rLHR has a lesser effect on agonist-induced internalization (Table 1) and no effect on the degradation of the internalized hormone (Table 3), but it impairs the targeting of the nascent rLHR to the plasma membrane (Table 4). The finding that mutation of L615 and L616 of the rLHR or mutation of D611, an upstream acidic residue conserved in many GPCRs (Fig. 1 and Table 4), impairs the targeting of the nascent rLHR to the plasma membrane represents the second example of the involvement of a dileucine-based motif preceded by an acidic residue (D/ExxxLL; see Fig.1) in the targeting of a nascent GPCR to the plasma membrane. Thus, mutation of the two adjacent leucines or the upstream glutamic acid of the D/ExxxLL motif present in the C-terminal tail of the vasopressin V2 receptor (Fig. 1) has recently been shown to prevent the exit of the nascent vasopressin V2receptor from the endoplasmic reticulum to the plasma membrane (Schulein et al., 1998). Although we did not attempt to establish the intracellular location of the D/ExxxLL mutants of the rLHR, it is likely that they are trapped in the endoplasmic reticulum because all other intracellularly trapped mutants of the rLHR have been shown to be located in this compartment (Rozell et al., 1995; Fabritz et al., 1998). It should also be mentioned that the D/ExxxLL sequence is not the only motif involved in the proper membrane localization of the rLHR, however, because there are many other mutations of residues present in the extracellular, transmembrane, or intracellular domains of the rLHR that result in intracellular trapping (Segaloff and Ascoli, 1993; Wang et al., 1993; Rozell et al., 1995). More importantly, the results presented here on the effect of mutation of L613 and L614 on the agonist-induced endocytosis of the LHR represent the first example of a dileucine-based motif that impairs endocytosis. All other reports on the involvement of dileucine-based motifs on the endocytosis of cell surface receptors have shown that such motifs facilitate endocytosis. Thus, mutation of dileucine motifs has been shown to inhibit the endocytosis of several single transmembrane receptors such as the T cell receptor (Dietrich et al., 1997; Geisler et al., 1998), the insulin receptor (Hamer et al., 1997), the growth hormone receptor (Govers et al., 1998), the prolactin receptor (Vincent et al., 1997), and one GPCR, the β2-adrenergic receptor (Gabilondo et al., 1997). The intracellular location of L613 and L614, as well as the finding that their mutation enhances the agonist-induced endocytosis of the rLHR without affecting agonist-induced activation, suggests that these two residues are directly involved in the interaction of the rLHR with the endocytic machinery. This conclusion is in agreement with all the knowledge about dileucine motifs derived from the study of other receptors. Thus, all the dileucine motifs previously identified as being involved in the endocytosis of other receptors are located in their intracellular regions (Gabilondo et al., 1997; Hamer et al., 1997; Geisler et al., 1998; Govers et al., 1998). Moreover, like tyrosine-based motifs, dileucine-based motifs are thought to participate in protein sorting through their direct interaction with two clathrin adaptor protein (AP) complexes: AP-1, which is found associated with clathrin in the trans-Golgi network, and AP-2, which is found in association with clathrin at the plasma membrane (Dietrich et al., 1997; Kirchhausen et al., 1997; Rapoport et al., 1998). Although AP-2 is thought to function as an adaptor in the clathrin-dependent endocytosis of single transmembrane receptors with tyrosine- or dileucine-based motifs (Kirchhausen et al., 1997), the only clathrin adaptors that have been shown to participate in the endocytosis of GPCRs, including the LHR, are the nonvisual arrestins (Table 2 and Krupnick and Benovic, 1998; Lazari et al., 1998). Because the nonvisual arrestins participate in the endocytosis of GPCRs by bridging them to clathrin (Krupnick and Benovic, 1998), one hypothesis that would explain the enhanced internalization of rLHR-L613,614A is that this mutation enhances the binding of the nonvisual arrestins to the rLHR. This hypothesis is supported by the findings summarized in Table 2. First, theT1/2 of internalization of hCG in cells cotransfected with rLHR-L613,614A and an empty vector (∼18 min) is comparable with the T1/2 of internalization of hCG in cells cotransfected with the rLHR-wt and arrestin-3 (∼20 min). Second, although cotransfection with β-arrestin(319–418) shortens the T1/2 of internalization of hCG mediated by rLHR-wt and by rLHR-L613,614A, theT1/2 of internalization of hCG in cells expressing rLHR-L613,614A and β-arrestin(319–418; ∼118 min) is comparable with the T1/2 of internalization of hCG in cells expressing rLHR-wt only (∼100 min). Last, cotransfection with dynamin-K44A, a construct that blocks endocytosis at a step located downstream of the nonvisual arrestins (Damke et al., 1994), lengthens the T1/2 of internalization of 125I-hCG mediated by rLHR-wt or rLHR-L613,L614A to ∼215 and ∼231 min, respectively. An alternative hypothesis that is consistent with the results presented here states that the rLHR-wt is internalized by a pathway that involves both a nonvisual arrestin and AP-2. In this scenario, the involvement of AP-2 would be considered to be more important than the involvement of the nonvisual arrestins in the internalization of rLHR-wt, and it would be responsible for the slow rate of internalization of this receptor. Because the leucine-to-alanine mutations reported here are expected to disrupt the putative interaction of the rLHR with AP-2 (Kirchhausen et al., 1997), the involvement of the nonvisual arrestins would become more important than the involvement of AP-2 in the internalization of rLHR-L613,L614A, thus shortening theT1/2 of internalization of this mutant. We thank Dr. Deborah Segaloff for critical reading of the manuscript. We also thank Ares Advanced Technology for their generous gift of the hLHR cDNA, Dr. Jeffrey L. Benovic (Thomas Jefferson University) for providing arrestin-3 and β-arrestin(319–418) expression vectors, Dr. Steve Wiley (University of Utah) for providing the spreadsheet to determine ke, and Dr. Sandra Schmid (Scripps Research Institute) for the dynamin-K44A plasmid. While this manuscript was under review, a paper was published implicating AP-2 as a clarthrin adaptor in the internalization of the β2-adrenergic receptor [LaPorte SA, Oakley RH, Zhang J, Holt JA, Ferguson SSG, Caron MG and Burak LS (1999) The β2-adrenergic receptor/barrestin complex recruits the clathrin adaptor AP-2 during endocytosis. Proc Natl Acad Sci USA 96:3712–3717]. This work was supported by National Institutes of Health Grant CA40629 (to M.A.). The services and facilities provided by the Diabetes and Endocrinology Research Center of the University of Iowa (supported by National Institutes of Health Grant DK25295) are also gratefully acknowledged. K.N. was partially supported by a fellowship from the Lalor Foundation. (1982) Internalization and degradation of receptor-bound human choriogonadotropin in Leydig tumor cells: Fate of the hormone subunits. J Biol Chem 257:13306–13311. (1983) An improved method for the solubilization of stable gonadotropin receptors. Endocrinology 113:2129–2134. (1984) Lysosomal accumulation of the hormone-receptor complex during receptor-mediated endocytosis of human choriogonadotropin. J Cell Biol 99:1242–1250. (1978) Gonadotropin binding and stimulation of steroidogenesis in Leydig tumor cells. Proc Natl Acad Sci USA 75:99–102. (1987) On the fates of receptor-bound human ovine luteinizing hormone and human choriogonadotropin in cultured Leydig tumor cells: Demonstration of similar rates of internalization. Endocrinology 120:1161–1172. (1996) Two mutations of the lutropin/choriogonadotropin receptor that impair signal transduction also interfere with receptor-mediated endocytosis. Mol Endocrinol 10:544–554. (1997) Regulation and function of the CD3γ DxxxLL motif: A binding site for adaptor protein-1 and adaptor protein-2 in vitro. J Cell Biol 138:271–281. (1998) Transfected cells express mostly the intracellular precursor of the lutropin/choriogonadotropin receptor but this precursor binds choriogonadotropin with high affinity. Biochemistry 37:664–672. (1997) Pleiotropic role for GRKs and β-arrestins in receptor regulation. News Physiol Sci 12:145–151. (1997) A dileucine motif in the C terminus of the β2-adrenergic receptor is involved in receptor internalization. Proc Natl Acad Sci USA 94:12285–12290. (1998) Leucine-based receptor sorting motifs are dependent on the spacing relative to the plasma membrane. J Biol Chem 273:21316–21323. (1992) Pathways of internalization of the hCG/LH receptor: Immunoelectron microscopic studies in Leydig cells and transfected L cells. J Cell Biol 118:1347–1358. (1998) Di-leucine-mediated internalization of ligand by a truncated growth hormone receptor is independent of the ubiquitin conjugation system. J Biol Chem 273:16426–16433. (1997) Dual role of a dileucine motif in insulin receptor endocytosis. J Biol Chem 272:21685–21691. (1991) The slow rate of internalization of deglycosylated hCG is not due to its inability to stimulate cAMP accumulation. Endocrinology 128:2837–2843. (1994) Palmitoylation of luteinizing hormone/human choriogonadotropin receptors in transfected cells. J Biol Chem 269:30651–30658. (1997) Linking cargo to vesicle formation: Receptor tail interactions with coat proteins. Curr Opin Cell Biol 9:488–495. (1997) Endocytosis and recycling of G protein-coupled receptors. Trends Pharmacol Sci 18:276–287. (1998) The role of receptor kinases and arrestins in G protein-coupled receptor regulation. Annu Rev Pharmacol Toxicol 38:289–319. (1997) Arrestin/clathrin interaction: Localization of the clathrin binding domain of nonvisual arrestins to the carboxyl terminus. J Biol Chem 272:15011–15016. (1997) Modulation of the arrestin-clathrin interaction in cells. J Biol Chem 272:32507–32512. (1998) Mutation of individual serine residues in the C-terminal tail of the lutropin/choriogonadotropin (LH/CG) receptor reveal distinct structural requirements for agonist-induced uncoupling and agonist-induced internalization. J Biol Chem 273:18316–18324. (1998) G protein-coupled receptors, III, New roles for receptor kinases and β-arrestins in receptor signaling and desensitization. J Biol Chem 273:18677–18680. (1983) On the mechanisms involved in the regulation of the cell surface receptors for human choriogonadotropin and mouse epidermal growth factor in cultured Leydig tumor cells. J Cell Biol 96:521–526. (1989) Lutropin-choriogonadotropin receptor: An unusual member of the G protein-coupled receptor family. Science (Wash DC) 245:494–499. (1998) Mutations that induce constitutive activation and mutations that impair signal transduction modulate the basal and/or agonist-stimulated internalization of the lutropin/choriogonadotropin receptor. J Biol Chem 273:34911–34919. (1990) Cloning and sequencing of human LH/hCG receptor cDNA. Biochem Biophys Res Commun 172:1049–1054. Nakamura K, Liu X and Ascoli M (1999) The rate of internalization of the gonadotropin receptors is greatly affected by the origin of extracellular domain. J Biol Chem, in press..
(1999) Internalization of the TXA2 receptor α and β isoforms. J Biol Chem 274:8941–8948. (1998) Dileucine-based sorting signals bind to the β-chain of AP-1 at a site distinct and regulated differently from the tyrosine-based motif binding site. EMBO J 17:2148–2155. (1992) Effects of truncations of the cytoplasmic tail of the lutropin/choriogonadotropin receptor on receptor-mediated hormone internalization. Mol Endocrinol 6:327–336. (1995) Intracellular retention of mutant gonadotropin receptors results in loss of hormone binding activity of the follitropin receptor but not the lutropin/choriogonadotropin receptor. Mol Endocrinol 9:1727–1736. (1998) A dileucine sequence and an upstream glutamate residue in the intracellular carboxyl terminus of the vasopressin V2 receptor are essential for cell surface transport in COS.M6 cells. Mol Pharmacol 54:525–535. (1993) The lutropin/choriogonadotropin (LH/CG) receptor… 4 years later. Endocr Rev 14:324–347. (1997) Identification of cytoplasmic motifs required for short prolactin receptor internalization. J Biol Chem 272:7062–7068. (1996) Progressive cytoplasmic tail truncations of the lutropin-choriogonadotropin receptor prevent agonist- or phorbol ester-induced phosphorylation, impair agonist- or phorbol ester-induced desensitization and enhance agonist-induced receptor down-regulation. Mol Endocrinol 10:748–759. (1997) Phosphorylation of the lutropin/choriogonadotropin receptor facilitates uncoupling of the receptor from adenylyl cyclase and endocytosis of the bound hormone. Mol Endocrinol 11:183–192. (1993) Mutation of a highly conserved acidic residue present in the second intracellular loop of G protein-coupled receptors does not impair hormone binding or signal transduction of the LH/CG receptor. Mol Endocrinol 7:85–93. (1981) A steady state model for analyzing the cellular binding, internalization and degradation of polypeptide ligands. Cell 25:433–440. (1982) The endocytotic rate constant: A cellular parameter for quantitating receptor-mediated endocytosis. J Biol Chem 257:4222–4229.